A hat on a stick in the bush. This is how employees of the firm contracted to supply the machinery for the momentous Coolgardie Water Supply Scheme marked the spot of where a pumping station would be built. Battye Library. A hat on a stick marking the the spot where No 5 will be built in the bush. A photograph would record the place and date. Two years later a magnificent red brick building would stand in that very spot. The time given for the completion of the work, viz., twenty-seven calendar months, was exceedingly short, bearing in mind its magnitude. It was, therefore, necessary to arrange for the engine and boiler erection to be carried on simultaneously at the eight stations. Not only did the equipment have to be manufactured, shipped out from London and then railed to the various eight pumping stations on the pipeline’s route, but employees had to be recruited, accommodation provided and more. 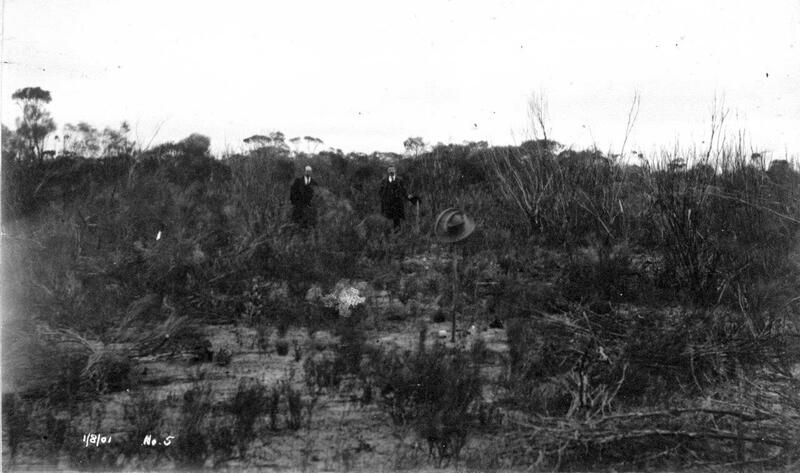 In most countries where waterworks or other engines are to be erected the site of the engine house, &c., is situated within reasonable distance of some town or available place, where men could find lodging and food, and where supplies, stores, &c., could be obtained, On the Coolgardie contract this was not possible. Most of the engine sites are miles away from any source of supply, not only of food, but of what is in a dry country even more necessary, water. The firm applied military precision to overcoming the difficulties. At each pumping station site a plot of land leased from the government was enclosed and permanent camps, workshops and mess-rooms erected within the compound. A formal lease enabled Simpson to enforce strict regulations. It was a time when typhoid was an ever present danger in Western Australia and even one of the reasons for the construction of the water supply scheme. The most stringent regulations as to sanitation were rigidly enforced, with the result that no serious case of illness in any of the camps occurred. In addition to the camps for the men to live in, small workshops were erected both for the storage of tools, gear, machinery, and the carrying out of small repairs. The government itself was to be responsible for the eight buildings to house the machinery. When George Hawke, Simpson’s machinery erection supervisor, arrived in Western Australia in November 1900 he was furious. He had had to be persuaded to take on the project – having worked for Simpson in various places around the world he was content to stay put as foreman of the firm’s engineering works in London. His first challenge was supposed to be to oversee the erection of the travelling cranes, the first pieces of equipment sent out by Simpson with the intention they would be used to hoist the machinery into place. But work had not started on any of the pumping station foundations even! Some might argue work on the first two pumping stations near Mundaring Weir had to be delayed in case the weir site had to be abandoned due to a rift in the solid rock in the river bed. But O’Connor’s pronouncement that the foundations were satisfactory and that the pouring of concrete could begin was at the end of December, 1899. What’s more, railway sidings required for the delivery of machinery to the pumping stations hadn’t even been built when George Hawke arrived. Was it to help out his friend CY O’Connor that George Temple Poole, formerly Chief Architect for the Public Works Department, rejoined the department? Richard Hartley, who wrote River of Steel, the history of the first 100 years of the scheme postulates. 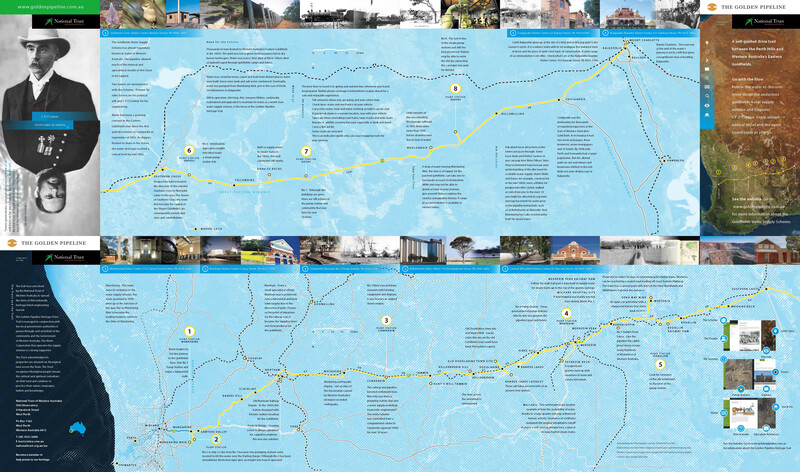 Poole came back to work specifically on buildings for the Coolgardie Water Scheme, houses for the staff as well as the pumping stations. As a result, the elegant brick pumping station buildings have architectural features such as bulls eye windows. The design consisted of two rooms with a passage in between under a corrugated iron roof: the boiler room (or house) with a concrete floor and an engine room (or house) with a lower floor at basement level of concrete. The upper or working floor of jarrah rested on steel joints. The engines and pumps were bolted on to granite bed-stones supported by brick piers resting on the lower concrete floor. At the other end, the cylinders for the steam that powered the pumps were allowed to move freely on expansion rollers. Pulleys, tree trunk derricks and wooden rollers lifted the heavy cylinders, boilers and pumps into place. Battye Library. 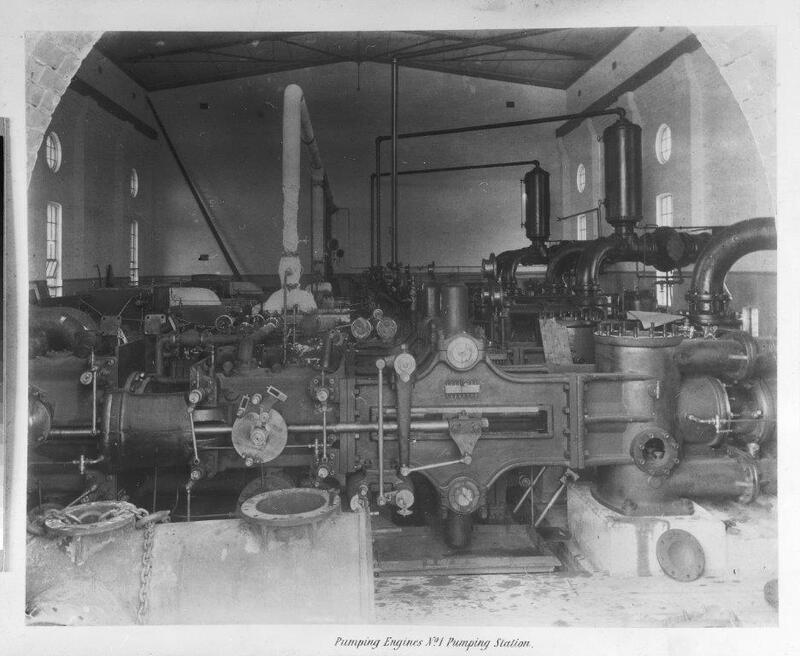 Pump station interior. Only more than two years after his arrival (January 1902) was George Hawke able to start erecting machinery at the site when the department was about to start on the building work for No 1. The too-late-for-purpose travelling crane destined for No 1 can be seen in situ today. As for George, well, he never went back to live in London and became Superintendent of Machinery. He sent for his brother too and Charles Hawke ended up in charge of No 2 Pumping Station.